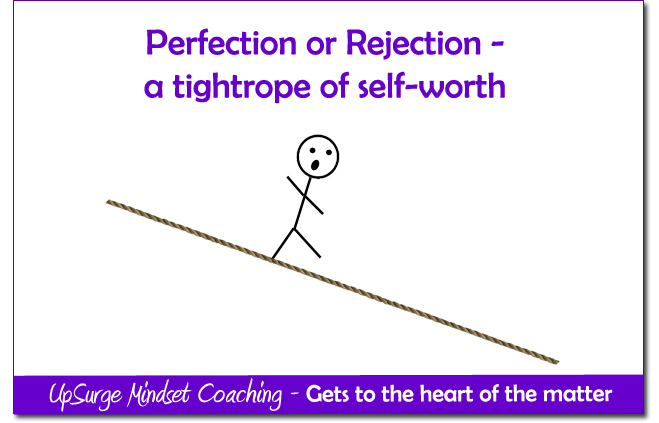 Do you talk about yourself as a perfectionist with hint of pride? I used to – I thought it meant I had high standards and was prepared to put in the effort to hold myself to those in all that I did. Back in the days when I polished my halo of perfectionism I also spent a lot of my time trying to figure out how to be considered ‘good’ from other people’s points of view. Well that turned out to be a dead end road to confusion, exhaustion and disappointment! It’s the belief that if we do things perfectly and look perfect, we can minimise or avoid the pain of blame, judgement, and shame. Woah, how did she hack (view computer hack rather than machete type of hack) into my head? She just pulled my whole carpet of ‘How to be good’ out from under me – what was I going to do now? (mild panic face) Reframing your life events/decisions/motivations from a new perspective can be both very refreshing and very upsetting depending on how resilient you are feeling at the time. So many of the things you considered ‘true’ were now sitting on very shaky ground and your ‘rules’ tend to shred all around you like confetti at a wedding but much less romantic. Now that sounds like a recipe for vulnerability…hell yeah! Give me back my rule book! So here I am with a shredded rule book and no guidance on how to ‘earn’ my ‘good’ status and my hyperactive logic brain starts whirring at mega-speed trying to fathom a solution…and it fails miserably for what seems like the first time in my life. Then a little voice inside of me says ‘if you knew you were enough just the way you are then you wouldn’t have to ‘earn’ anything’ – logic brain implodes saying this is potentially the most ridiculous thing it’s ever heard and so begin a journey to ‘enoughness’. I had go toe to toe with my greatest fear that if I took the pressure off myself I would turn into an human sloth (not offence to sloths – they are actually really cute – but I am sure you get what I mean). So did I really think this was the ‘real me’? For me it conjured up a picture of being glued to the sofa watching soap operas, constantly stuffing potato chips in my mouth with my only exercise getting to the fridge, bathroom and bedroom. Ha? That’s not a very nice thing to think about yourself – and there was my first clue. I didn’t think very nice things about myself! For some reason I thought I could bully myself into great achievement. Emm, but at what cost and who’s definition of great achievement? My parent’s, my past teacher’s, my husband’s, my work colleagues, my bosses…the list goes on. It’s a bewildering range of definitions and a perfectionist believes they need to please everyone. But hey, I didn’t put me on the list – a perfectionist ‘fix’ is not from pleasing ourselves – it’s from getting approval from others! I now don’t consider ‘enoughness‘ as a status I will acquire – it’s more about how I relate to myself day to day, sometimes minute to minute. Kinda like filter with which to view life’s events. I feel like their should be groups called ‘Perfectists Anonymous‘ and we support each other in the diligent pursuit of ‘enoughness’. So what did I do? How did life change? Outwardly – hardly anything changed. Inwardly – everything did. But that’s a blog for another day. How about you? Are you a extro-perfectionist, intro-perfectionist or nestling snuggly in your sumptuous enoughness?